In Malawi, net forest cover loss over time is associated with reduced dietary diversity and consumption of vitamin A-rich foods among children. Greater forest cover is associated with reduced risk of diarrheal disease. These preliminary findings suggest that protection of natural ecosystems could play an important role in improving health outcomes. Healthy forests provide human communities with a host of important ecosystem services, including the provision of food, clean water, fuel, and natural medicines. Yet globally, about 13 million hectares of forests are lost every year, with the biggest losses in Africa and South America. As biodiversity loss and ecosystem degradation due to deforestation continue at unprecedented rates, with concomitant loss of ecosystem services, impacts on human health remain poorly understood. Here, we use data from the 2010 Malawi Demographic and Health Survey, linked with satellite remote sensing data on forest cover, to explore and better understand this relationship. Our analysis finds that forest cover is associated with improved health and nutrition outcomes among children in Malawi. 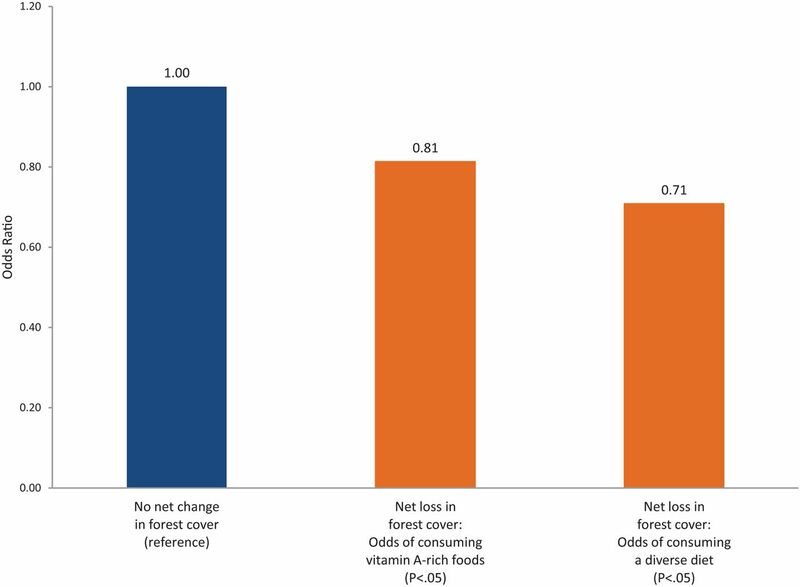 Children living in areas with net forest cover loss between 2000 and 2010 were 19% less likely to have a diverse diet and 29% less likely to consume vitamin A-rich foods than children living in areas with no net change in forest cover. 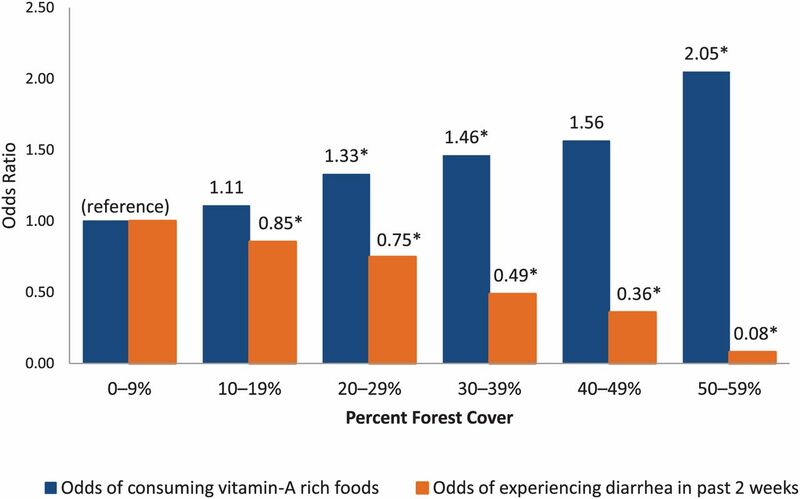 Conversely, children living in communities with higher percentages of forest cover were more likely to consume vitamin A-rich foods and less likely to experience diarrhea. Net gain in forest cover over the 10-year period was associated with a 34% decrease in the odds of children experiencing diarrhea (P = .002). Given that our analysis relied on observational data and that there were potential unknown factors for which we could not account, these preliminary findings demonstrate only associations, not causal relationships, between forest cover and child health and nutrition outcomes. However, the findings raise concerns about the potential short- and long-term impacts of ongoing deforestation and ecosystem degradation on community health in Malawi, and they suggest that preventing forest loss and maintaining the ecosystem services of forests are important factors in improving human health and nutrition outcomes. Although all populations fundamentally depend on the natural environment, people living in rural areas of the developing world are most directly dependent on ecosystem services to meet their basic needs.5 As biodiversity loss and ecosystem degradation continue at unprecedented rates, there is increasing concern about potential public health impacts, especially among the world's most vulnerable populations. More than 1.5 billion people worldwide rely on forest products for their livelihoods, but 13 million hectares of forests are lost every year. To better understand the potential health and nutrition impacts of deforestation, we conducted a case study of Malawi using 2010 Demographic and Health Survey (DHS) data linked, via geographic information system (GIS) points, with satellite remote sensing data on forest cover and change in forest cover over a decade's time. We hypothesized that deforestation and lower percentages of forest cover (proxies for degraded environments) result in declining ecosystem services, which then open pathways to child undernutrition and poor health. Ecosystems provide several benefits to people, such as food, water, flood protection, waste absorption, and crop pollination. Conversely, we hypothesized that more biodiverse environments, represented by higher percentages of forest cover, have comparatively better capacity to provide essential ecosystem services, which then translate into improved human nutrition and health outcomes. Our outcomes of interest include children's dietary diversity, consumption of vitamin A-rich foods, stunting, and experience of diarrheal disease. We expect these outcomes to be associated particularly with the level and quality of provisioning and regulating ecosystem services. A comprehensive description of the complex and nonlinear relationships between the environment and human health outcomes is beyond the scope of this paper. However, our conceptual framework provides a simple illustration of the 3 hypothesized relationships that we explore in this analysis: (a) between forest cover and nutritional outcomes; (b) between forest cover and health outcomes; and (c) the mediating function of women's time on the relationship between forest cover and nutritional outcomes (Figure 1). We hypothesize that biodiverse environments are better able to produce ecosystem services, such as food and clean water, which, in turn, improve the quantity and quality of food consumption by children and reduce diseases, leading ultimately to better health and nutrition outcomes. Mother's time acts as a mediating factor between biodiversity and child health and nutrition outcomes. Poor, rural residents often rely on forest foods for their nutrients. These studies demonstrate reliance on NTFPs, particularly among the rural poor, and provide a strong basis for the hypothesis that deforestation results in decreased availability of forest foods, which in turn can lead to comparatively poorer nutritional outcomes among children as well as adults. In Indonesia, a study found that residents of households living downstream from protected forested watersheds were less likely to experience diarrhea than those living downstream from unforested watersheds, demonstrating the regulating services of forests in improving quality of drinking water.13 Similarly, we hypothesize that children living in households close to forest cover will experience reduced odds of diarrheal disease compared with children not living close to forest cover. Forests help to improve the quality of drinking water. The Nepal study6 demonstrated a negative association between deforestation and women's time allocation on nutrition-related functions such as food preparation and breastfeeding, subsequently limiting women's ability to provide nutrition to their children. Although we cannot test the role of women's time allocation in mediating the hypothesized relationship between forest cover and child health and nutrition outcomes in this study, we believe it is important to represent this mediating function in the conceptual model, given the well-demonstrated centrality of women's role in ensuring child health and nutrition outcomes. We obtained nutritional status and dietary consumption data, as well as other individual-level characteristics, from the 2010 Malawi DHS. The DHS are a key source of comparative quantitative data across developing countries on demographic and health indicators, including for reproductive health, maternal and child health, and nutritional status of women and children. They are nationally and sub-nationally representative household surveys with large sample sizes and detailed data obtained by interviewing women of reproductive age (15–49 years old) to obtain information about their children and other household members. The data also include information on household and other socioeconomic characteristics of sampled women and their households. The DHS are implemented using a stratified 2-stage cluster sampling design. In Malawi, more than 23,000 households participated in the 2010 survey (household response rate: 98%; individual women's response rate: 97%).16 For more information about the DHS, see www.measuredhs.com. We used 2 types of satellite remote sensing variables in this analysis: the Vegetation Continuous Fields (VCF) product17 and the Normalized Difference Vegetation Index (NDVI).18 A full technical description of the satellite remote sensing data sets used in this analysis is available in the supplementary Appendix; the variables are described below. During DHS fieldwork activities, surveyors collected the GPS coordinates for the center of the populated area surveyed (cluster centroid) using handheld GPS units. Of importance to this analysis is that the GPS coordinates are displaced to ensure respondent confidentiality.16 The displacement is randomly applied so that rural points contain a minimum of 0 km and a maximum of 5 km of positional error. Urban points contain a minimum of 0 km and a maximum of 2 km of error. A further 1% of the rural sample points are offset a minimum of 0 km and a maximum of 10 km. We overlaid DHS data with average NDVI data derived from NASA's Moderate Resolution Imaging Spectroradiometer (MODIS) (a key satellite instrument that views the Earth's surface) at each DHS cluster centroid for 2010. We used a similar procedure with the VCF product to link the percent forest cover variable and the change in forest cover variable to the 2010 Malawi DHS data set. We chose to aggregate the satellite data to 5 km resolution to ensure that even after displacement of DHS GPS coordinates, environmental variability and tree cover were accurately represented for each DHS cluster. Displacement errors were below the spatial resolution of the satellite remote sensing. Our analysis explored 4 dependent, dichotomous variables: severe stunting, dietary diversity, consumption of vitamin A-rich foods, and diarrhea. We calculated our key independent variables from the remotely sensed VCF data product mentioned earlier. The VCF contains proportional estimates for vegetative cover types; it shows how much of a land cover, such as “forest” or “grassland,” exists on the land surface. The variable reflecting decadal change in forest cover leverages the longitudinal nature of the satellite remote sensing data. Adding this temporal dimension to the analysis strengthened our study considerably over using only a static measure of forest cover taken at the time of the survey, allowing us to test, in effect, the relationship between forest change over time (loss or gain) and our outcomes of interest. Variables controlled for in the analysis include child's age (grouped into 6-month categories), mother's education (none, primary, secondary or higher), urban or rural residence, household wealth quintiles, number of years resident in the current location, and a remotely sensed vegetation index (NDVI). The model for diarrhea includes whether the household has access to a safer toilet facility and water source. Selection of variables was driven in part by data availability, given that we are analyzing secondary source data. The variable on mother's education is a self-reported measure reflecting the mother's highest education level achieved at the time of the survey. Respondents are asked to report the level of highest achievement and the grade achieved within that level. Our analysis used a recoded categorical variable that reflects attainment of: no education, primary education, and secondary education or higher. Mother's education is related to a child's height-for-age20: mothers who are better-educated may be more knowledgeable about nutrition and optimal child care behaviors, enabling them to improve health outcomes for their children. The NDVI is a satellite remote sensing variable that quantifies the concentrations of green leaf vegetation on the ground, providing an integrated estimate of vegetation health and a means of monitoring changes in vegetation over time. We used NDVI as a proxy control for the growing conditions of the area during the growing season immediately prior to administration of the DHS survey; it is the average NDVI for December, January, and February prior to DHS implementation (June through November 2010). When vegetation is brown because it is the dry season, or because the climate is unusually dry, the NDVI is low. When the climate is wet, and the grass, trees, and other land cover is green, the NDVI is high. There is 1 NDVI measurement associated with each DHS sampling cluster. We conducted multivariate analyses using unweighted binomial logistic regressions to examine the correlation between our independent variables of interest (forest cover or decadal change in forest cover) and our selected dichotomous outcome variables (severe stunting, dietary diversity, consumption of vitamin-A rich foods, and experience of diarrhea), while controlling for confounding factors for which data were available. Logistic regression does not impose restrictive normality assumptions on predictors. The results are expressed in odds ratios that indicate the associations between the independent and dependent variables without attributing causality. Only the most recent birth for each mother interviewed was included in the analysis to avoid intra-household correlations in the selected outcomes. The unweighted number of cases contributing to each analysis was as follows: dietary diversity (n = 9,166), consumption of vitamin A-rich foods (n = 9,166), experience of diarrhea (n = 12,831), and stunting (n = 3,173). We found that children living in DHS clusters with a net loss of forest cover over the past decade were 19% less likely to have a diverse diet and 29% less likely to consume vitamin A-rich foods than children living in clusters with no net change in forest cover (Figure 2). These differences were statistically significant. Children living in areas with a net loss of forest cover were significantly less likely to have a diverse diet and to consume vitamin-A rich foods than children living in areas with no net change in forest cover. 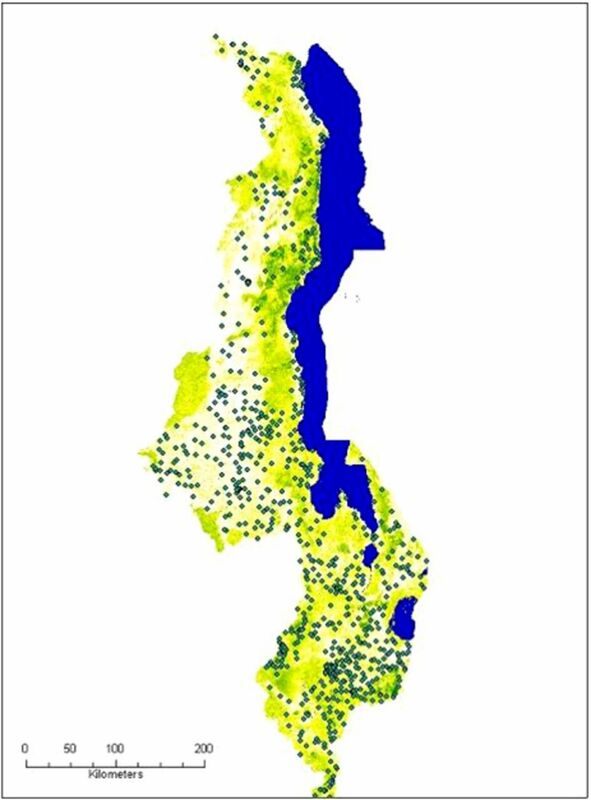 Map of Malawi showing 2010 forest cover overlaid with sampling clusters from the 2010 Malawi DHS. Our results demonstrate an association between forest cover and selected nutrition-related outcomes. A study in 3 villages in southern Malawi found that, on average, almost two-thirds of households sampled consumed wild fruit, vegetables, and mushrooms from the forest, and almost one-quarter consumed bushmeat to supplement their diets.26 Nearly 70% of study participants were dependent on wood collected from forests for cooking. The dependence of these rural populations on forest products is consistent with our finding that dietary diversity and consumption of vitamin A-rich foods decrease with net decadal loss in forest cover. With respect to increased forest cover over time, we did not find a positive association with dietary diversity, and actually found a marginally significant positive relationship with severe stunting. It is our understanding, based on expert observations from Malawi, that reforested areas tend to be plantations with monocultures of non-native trees. Such areas may not provide the same diversity of animal and vegetable nutrition as native forests. Additionally, access of local populations to reforested areas tends to be more restricted than to native forests. Such reforested areas usually are privately held (for example, in the case of tea plantations) or strictly controlled by a village committee or individual. In contrast, while native forests are tightly regulated by law, in practice they are heavily accessed and used. Reduction in access to NTFPs from such reforested areas could also lead to poorer nutritional outcomes for nearby communities. Further research is needed to support these hypotheses, however. Forest cover is significantly associated with reduced child diarrheal disease. Our results also demonstrate an association between forest cover and reduced child diarrheal disease, supporting the hypothesis that forests play an important provisioning role, specifically in terms of water availability and/or quality, 2 factors that impact diarrheal risk in developing countries.27 Forests help to maintain healthy watersheds, prevent soil erosion, and filter impurities from water, all of which positively impact water availability and quality.28 Our finding that an increase in decadal forest cover reduces diarrhea risk suggests that tree plantations, which are the primary source of increasing forest cover in Malawi, may be as effective as older forests with regard to this particular health outcome. In 2008, the Maternal and Child Undernutrition Study Group estimated that co-exposure of nutrition-related factors, such as vitamin A and iron deficiency, were together responsible for about 35% of child deaths worldwide and for 11% of the total global disease burden.29 The authors noted that the evidence makes a compelling case for the urgent implementation of interventions to reduce the various forms of undernutrition or to ameliorate their consequences. Protecting natural ecosystems could be a sustainable and effective way to improve child nutrition and health. Our results provide preliminary evidence suggesting that an equitable, sustainable, and effective way to improve child nutrition—and hence, survival—outcomes could include ensuring the integrity of natural ecosystems. Such an integrated approach would result in ecosystems that are healthy enough to deliver the services that local communities depend on, including foods with high nutrient bioavailability and clean water, which is essential in preventing diarrheal disease. Given the limitations of the currently available data, it was possible to demonstrate only associations, not causal relationships, in this analysis. To establish the causal pathways and mechanisms responsible for the demonstrated associations between forest cover and child health and nutrition outcomes in Malawi, further research is needed, involving collection of accurately geo-referenced, longitudinal population and health data and women's time allocation data, as well as concomitant collection and testing of water samples for quality and use of newly-available 30-meter remote sensing data. This research was primarily supported by the Forestry and Biodiversity Office, Bureau for Economic Growth, Education and the Environment (E3 Bureau), at the United States Agency for International Development (USAID), with additional support provided by the Famine Early Warning System Network (FEWS NET) program at USAID's Office of Food for Peace. We would like to thank USAID's Global Health Bureau for their assistance with this project. The views expressed in this article are the authors' only and do not necessarily represent those of the United States Agency for International Development or the U.S. Government. We are indebted to Mark Carroll for preparing the forest cover and deforestation data for this analysis. This paper has benefited from discussions with Monica Kothari on the use of the minimum dietary diversity indicator. We thank Richard Mantovani for his review of a prior draft of our manuscript. We are grateful to the USAID Biodiversity team and all USAID staff who generously shared their insights and expertise, including Brent McCusker, Richard Volk, Sharon Murray, Mary Rowen, Cynthia Gill, Diane Adams, and Rochelle Rainey. Finally, we thank the reviewers for their insightful comments, and the editors of Global Health: Science and Practice for their generous contributions of time and expertise. Cite this article as: Johnson KB, Jacob A, Brown ME. Forest cover associated with improved child health and nutrition: evidence from the Malawi Demographic and Health Survey and satellite data. Glob Health Sci Pract. 2013;1(2):237-248. http://dx.doi.org/10.9745/GHSP-D-13-00055.
. Dysfunctional hotspots? Pan-tropical changes in dung beetle communities and declining ecosystem functions. Presented at: Annual Meeting of the International Congress for Conservation Biology; 2008 Jul 10; Chattanooga, TN.
. Avoiding unplanned mosaic degradation and deforestation in Malawi. Blantyre, Malawi: Plan Vivo; 2009.
. Factors influencing the nutritional status of mothers and children in sub-Saharan Africa: an analytical report based on the Demographic and Health Surveys. Calverton, MD: Macro International Inc.; 1996.
. Vitamin A deficiency is prevalent in children less than 5 y of age in Nigeria. J Nutr. 2006;136(8), 2255–2261. Medline.